I can’t believe my own luck with the Aprilia RSV4s. Back in April of this year, I was in the only group that tested the Aprilia RSV4 Factory in the dry at Misano. Now, again at Estoril on the 2010 Aprilia RSV4 R, it seems I’ve been graced with a fairly exclusive dry ride. Exiting corners with 10,000+ rpm on an Aprilia RSV4 is one of the most satisfying things to do in motorcycling. It’s a vroooom moment. Full throttle in third gear with my knee down exiting Ayrton Senna, I have to keep a sharp eye on the wet patches. The Metzeler Racetech rear tire on the Aprilia span up earlier at a speed of 100 mph and, whilst I don’t mind a bit of drifting, a relatively cold December day in Portugal is not the day to challenge the grip too much. So, I’m a bit more cautious than I usually would be and the lap times suffered. Still, I was able to circulate Estoril within 15-20 seconds of the MotoGP lap record, which isn’t too bad at all. The Parabolica leads me on to one of the fastest straights on the MotoGP calendar. The straight is over a half-mile long, and it comes after a third- or fourth-gear corner. On the 2010 Aprilia RSV4 R, as with others, I short shifted up from second to third gear to allow the rear tire to do its job and to allow me to get the bike upright before shifting up to fourth. The Aprilia RSV4 six-speed gearbox is very precise, and I’m working my way up the gearbox without using the clutch. I did see around 165 mph at the end of the straight, but with more confidence in the tarmac conditions I could have left the braking later for an even higher top speed. The Aprilia RSV4 R monoblock Brembo brakes are the same as on the Factory, and they are immensely powerful and impressive. The deceleration from 165 mph going slightly downhill is certainly a job the Brembos do very well. The forces are dampened through a 43mm adjustable Showa fork rather than Ohlins on the R and the front tyre is a 120/70-ZR17 Metzeler Racetech rather than a Pirelli Diablo SuperCorsa. I know that the Factory setup is a better one that’d given me even more confidence and feel; however I’m still impressed with the RSV4 R chassis as it’s more than good enough for road and track day use. At the rear Aprilia have swapped the Factory’s Öhlins for a fully adjustable item from Sachs. The 6-spoke aluminum wheels are not as light as the forged items on the Factory, and overall the 395-pound Aprilia RSV4 R weighs in at 11 pounds more than the Factory. The interesting thing about the 2010 Aprilia RSV4 R is that, despite these 11 pounds, it still handles like a dream. The frame and swingarm can’t be adjusted in the way the Factory can, but you really need to spend a lot of time on a racetrack to utilize that adjustability. The Aprilia RSV4 R’s tech specs also reveal that the variable intake ducts are not in place, but acceleration from 9500 rpm and up to 13,000 is still immense, whilst the midrange is also powerful and very useful particularly on the road. The Aprilia 999cc V4 acts in a way that you’d thought it was a turbo kicking in above 10,000 rpm, but it’s just Aprilia’s masterful natural big bang engine coming seriously alive. The Aprilia V4 is very addictive and I felt no significant difference in this area between the two RSV4s, apart from perhaps a slightly “milder” throttle response. The one good thing about Estoril being slightly damp in the morning was that I finally got a good chance to ride a lot more using the powerful midrange. The Aprilia RSV4 R torque peak of 85 ft/lbs arrives at 10,000 rpm, but at these rpm the engine was way too powerful for the level of grip we experienced in the morning session. Between 7 and 10K rpm the midrange produces great pull, and even below 7000 rpm there’s plenty of go that’s exclusively reserved for the roads. Through the Gancho chicane that everybody loves to hate the speed is down to 35 mph, and the flick from left to right is done with ease, as there are no high revs or speed. On the Estoril circuit there’s plenty of hard acceleration through second and third gear as the corners are so slow. This gives a good feel with what the Aprilia RSV4 R is capable of in terms of pure acceleration from low speed. Imagine a 600 supersport with 180 horsepower and you’ll get the idea. Under both braking and acceleration, the RSV4 R feels very solid. It’s down to the tires what sort of grip you can achieve and, since it was cold and not completely dry, the Metzeler Racetechs performed well. Had it been hot and dry, I’m sure I’d been begging for the Pirellis. I must admit that I love the ergonomics on the Aprilia RSV4. The motorcycle looks tiny, but for a motorcycle with the size of a 600 and the power of a 1000 Aprilia really has nailed it when it comes down to ergonomics. I’m tall compared to Max Biaggi, but both of us feel at home on the RSV4 R. This is something we can thank Aprilia official test rider Alex Hoffman for, as he’s been instrumental in developing many things relating to how the RSV4 handles. You can look at pictures of me on the RSV4 R and think that the rider looks quite big on the bike, but the feel is nearly perfect in the seat. The whole package is so nimble and transferring weight is the easiest thing in the world. After each session I did the “hold a cup of coffee test” and almost no shake at all. This is very important as it proves how little vibration the V4 engine transfers to its pilot. I could mention a handful of inline fours and V-twins where this is not the case. The only time there’s a shake is when the RSV4 R reaches its upper rev range, and even the Sachs steering damper can’t tame the big lion completely then. There’s never danger for a proper tank slapper, but without the steering damper it would. I’m very tempted to say that the 2010 Aprilia RSV4 R is the best handling motorcycle available out there. 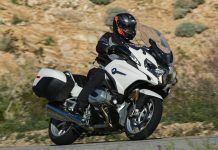 There are other motorcycles that handle just as solid and safe, but not quite with the same overall easiness of it all. The mass centralization is supreme, and all 180 horsepower is kept in check at all times through all the aluminum goodness. If you are in any doubt whether you should choose the RSV4 R in favor of the RSV4 Factory, then my advice is go for the RSV4 R, as the Factory isn’t worth the premium unless you really are going racing with it. On the road, it’ll still be just as much of a weapon as the Factory compared to its competition.